Looking for a snack to satisfy those between meal hunger pangs? Since snacks contribute about 25% of our daily calories, it’s important to have snacks that are great tasting, filling, and nutritious – rather than empty calories. Here we’re giving you 10 Smart Snack Ideas. One of the biggest myths about snacking is that it’s bad for you. The truth is, snacking can be healthy, and may help you actually lose weight. But that all depends on your snack choices. In fact, plenty of studies show that snacking—or eating smaller, more frequent meals —may be healthier for your body than three large meals per day. For example, researchers at the American Heart Association studied the effects of small frequent meals throughout the day and reported that it helps lower cholesterol and regulate blood sugar levels. In addition, some studies show that eating every few hours may help prevent overeating, which is beneficial for anyone trying to lose weight. Remember that smart snacking means selecting healthy options that fuel your body while keeping food portions under control. • A good rule of thumb is to eat snacks that are 100-200 calories each and they should contain significant amounts of several vitamins, minerals, protein or fiber. • It’s simple: snack on real food. Vegetables, fruit, nuts, seeds, beans, whole grains, poultry, fish and eggs. If it comes in a wrapper with an ingredient list a mile long, trade it in for some of the examples below. 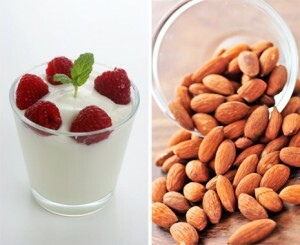 Snacks with protein and fiber slow digestion time, helping you feel fuller, longer. Protein, in particular, can be one of your best allies when it comes to snacking. Protein takes longer (and more energy) to digest, provides essential amino acids to maintain muscle mass and together, this helps to keep your metabolism higher helping your body burn calories more effectively. 1 ounce (23 almonds) provides 170 calories, 6 g protein, 3.5 g fiber, 75 mg calcium and 7.4 mg Vitamin E (highest of all nuts), antioxidants and heart healthy fats. A whole-grain cereal paired with low-fat milk and fresh fruit provides carbohydrate and protein, along with vitamins and minerals. Choose a cereal that has the “whole grain” seal, and has at least 3 grams of fiber per serving. Top with fresh fruit. Nonfat or low-fat Greek yogurt is thicker than other yogurt and contains more protein per serving (up to 23 grams of protein per cup) but slightly less calcium than regular yogurt. Top with fresh fruit. Athletes like cookies and these two contain some nutritional value; complex carbs and the benefits of dried fruits like figs, dates and raisins to boost fiber. These are good post-work out snacks to replenish muscle glycogen. Low fat chocolate milk is a hot sports recovery drink and many teams are using it after a workout to provide high quality protein and carbohydrates to stimulate muscle growth. Milk provides nine essential nutrients, 160 calories and 8 grams of protein in 8 ounces (1 cup). Peanut butter on whole grain bread is a high energy, tasty, portable snack. Peanut butter has heart healthy fat and is high in protein. 1 ounce of pistachios is 49 nuts—the most nuts per serving and low in calories with 160. Also high in fiber, vitamin B-6, and phytonutrients leutein and zeazanthin. One of my all-time favorites. Low-fat microwave popcorn is whole grain snack; when sprinkled with 2 Tablespoons of grated Parmesan cheese this snack adds protein and 120 mg of calcium. The key to this healthy snack is keeping the portions in check and finding or making a trail mix with dried fruit, nuts, seeds and whole grain cereal. Avoid the trail mix with candy pieces to reduce fat.